Craftin' Caro: Final day for Holiday Mini Catalogue orders! Final day for Holiday Mini Catalogue orders! Here's one of my all-season faves from the mini: The Gift Givers tag set! 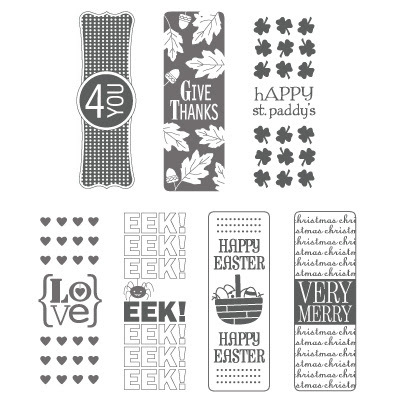 From Halloween to Easter to Christmas, this set has everything you need for all of your holiday stamping. Better yet, every single stamp in this seven-piece set coordinates with a different punch to help you create a variety of fun and festive projects. So whether you want to nab the Hanukkah stamp, yummy 3/8" Very Vanilla Designer Velvet Ribbon and 3/8" Cherry Cobbler Quilted Satin Ribbons, the Peekaboo Frames Bigz L Die set (so very versatile!) or some of the other exclusive Holiday mini items, be sure to place your order TODAY to avoid disappointment. Okay, final stamp set from the mini to remind you about: the It's a Wrap Holidays set! Designed to allow you to create wrappers for candy pieces such as the Hershey Nuggets, the versatile images in this seven-piece set also work well on cards, bookmarks, tags, and so much more! Not sure how to order? Just visit my Stampin' Up! online store and get started...orders will ship DIRECT TO YOU with no hassle!